If you are planning on investing in a home theater setup, these 4k projectors for home theater are definitely a great investment. These projects are specially built for big screen home theater and provide a cinematic-like appearance in 4K ultra-HD clarity. They can allow you to watch movies with pristine clarity and has HDR content support with the ability to decode HDR video signals for detailed video playback. 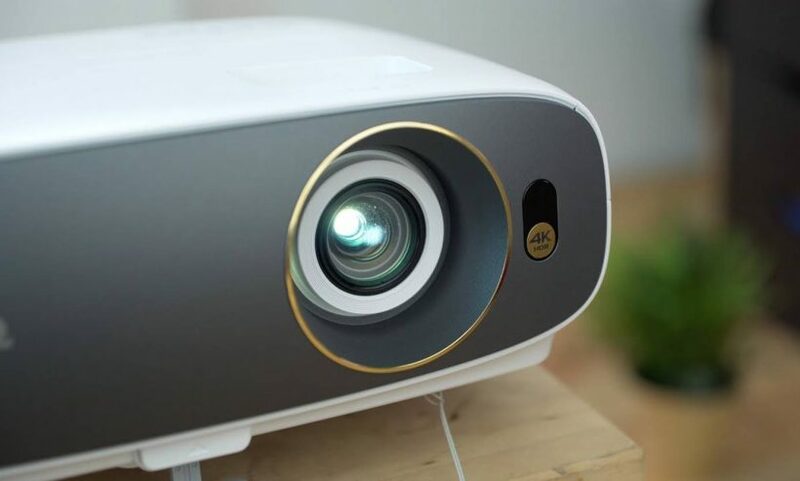 Furthermore these 4K projectors support flexibility connectivity including PCs, gaming consoles, mac and mobile input options with HDMI, HDCP and USB support. They are capable of rendering your movies in high-definition and provide a superb viewing experience. If you are looking to get a 4K projector for home theater, be sure to check out our top picks below! The ViewSonic PX727 is one of the best 4K projectors for home theater that we have tested. It delivers immersive theater-like experience in 4K ultra-HD (3840 x 2160 resolution) with 4X the clarity of full HD. The project supports a screen length of up to 300 inches in 2200 lumens. This home theater projector features RGBRGB color wheel with rec 709 and rec 2020 compatibility with colors that you would normally expect at the movie theater. Furthermore, this 4K project comes with HDR content support with the ability to decode HDR video signals for detailed video playback. Watching movies on the PX727 projector is a breath-taking experience with extremely sharp and crystal clear images and cinematic scenes. The video projection is ultra-HD and cinema-like – it delivers an experience that you can only expect at movie theathers. It has 2200 lumens which provides bright visuals and immersive audio in any room or home theater system. We also liked the fact that it provides a wide optical zoom which has more mounting flexibility over a standard 1.2x optical zoom, minimizing the installation hassle. The PX727 project supports multiple connectivity options and inputs such as HDMI, HDCP 1.4, HDCP 2.0, HDCP 2.2 and USB. The entire package comes with the PX727-4K projector, power cable, VGA cable and remote control for easy controls. The Optoma 4K projector for home theater is a powerful projector that delivers true 4K ultra high-definition 3840x2160p resolution, with bright 3000 lumens and cinematic color. It is a great investment if you are looking to upgrade your home theater system to get stunning visuals and movie scenes. The UHD60 features 3840 x 2160 4K UHD resolution to deliver a razor-sharp image with an impressive 8.3 million pixel image on screen. Furthermore, this project is high dynamic range (HDR) compatible in addition to wide color gamut to produce rich life-like color and bright white lights for optimal movie scenes. The HDR10 produces the brightest whites, deepest blacks and lifelike color due to the REC 2020 wide color gamut and DCI-P3 color gamut compatibility. In addition, the Optoma 4K projector dynamic black delivers 1,000,000:1 contrast ratio for exceptional black levels with quality displayable color ratios. In terms of video input, it supports HDMI 2.0 and HDCP 2.2 to deliver a full 18 Gbps for the best 4K UHD video bandwidth for image quality and device compatibility. We also liked the fact that the Optoma UHD60 features vertical lens shift and a 1.6X zoom for easy installation. If you are looking for the best 4K projector for home theater that can deliver really stunning movie performances and ultra-HD video, the Optoma UHD60 is a great choice. The Sony VPLVW285ES is a powerful 4K projector for home theater that displays high quality 1080p, 4k and 4k HDR movies. It has really vibrant colors reaching around 65% REC 202 and has pretty good black levels. This 4k projector delivers full 4k resolution at 4096 x 2160p which is really good – it has a white brightness of 1500 lumens and color brightness of 1500 lumens. Watching movies on the Sony 4k projector is a truly breath-taking experience – movie scenes are reproduced with great clarity and feels exactly like sitting in a digital cinema. The projector itself provides more than four times the resolution of full HD and delivers a picture that comes across as incredibly lifelike – it feels almost as though you are sitting in a real life movie scene. The Sony project uses HDMI cables for connectivity and the projector can also be easily mounted for display on a screen. 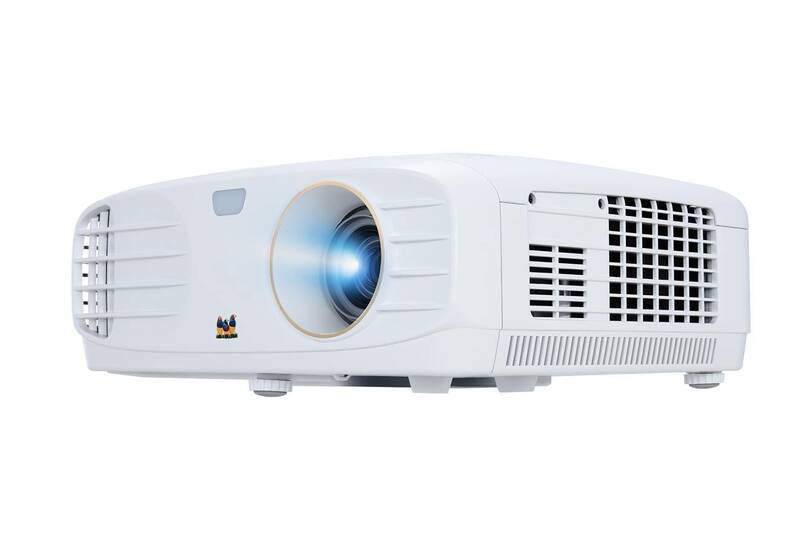 The projector has a vertical lens shift of +85%/-80% and horizontal shift of +/1 31%. The projector allows you to enjoy up to 200 inches in true 4k HDR in any room and is a very impressive movie projector that delivers immensely vivid movie scenes. 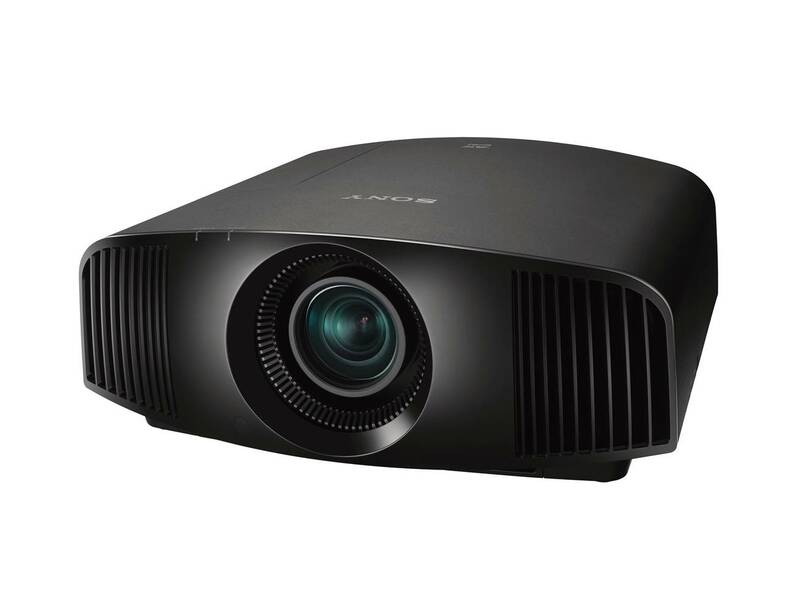 If you are looking for one of the best 4K projector for home theater that can deliver great value for money, the Sony VPLVW285ES is a great choice. The ViewSonic PX747 is one of the best 4K projectors for home theater that provides an immersive cinema-like experience in 4K Ultra-HD (3840 x 2160p). This is 4X the clarity of full HD, on a screen up to 300 inches in 3500 lumens which is really impressive for a projector of this size. This 4K projector has a high brightness of 3500 lumens and delivers stunning home entertainment in bright or dark rooms with visually stunning details. It also features HDR content support with the ability to decode HDR video signals and delivers incredibly detailed video playback. The ViewSonic PX747 also provides long lamp life with SuperEco mode which allows the lamp to shine bright for up to 15,000 hours. The ViewSonic projector has flexible connectivity options and supports most media players, gaming consoles, PCs, macs and mobile devices with input options including HDMI 1.4 with HDCP 1.4, HDMI 2.0 with HDCP 2.2 and USB inputs. The video projection from the ViewSonic PX747 is very stunning. It delivers high brightness with clear visuals and immersive audio in any room or environment, and has extreme mounting flexibility which provides a wider optical zoom over the standard 1.2x optical zoom. This 4K project also comes with a powerful 10W speaker that delivers crisp audio performance, and also has a backlit remote control which features illuminated buttons. The 4K projector has great mounting flexibility with wider optical zoom functionality and is easy to install. The entire package comes with the 4K UHD projector, power cable, VGA cable and remote control for easy setup. The Optoma HD27 is one of the best 4K projector for home theater that is very easy to setup and provides a stunning movie experience. This 4K projector comes with incredible 1080p HDR images with 3400 lumens for a realistic and lifelike movie scene reproduction – you can really see the difference with this projector and true ultra-HD vibrant colors. This projector supports HDMI 2.0 with HDCP 2.2 connectivity for 4K HDR input sources. It is also HDR10 compatible for gorgeous colors. This portable 4K projector is built with extended lamp life – the HD27HDR has a variety of energy saving features that enable high performance and low maintenance with 15,000 hours of lamp life. 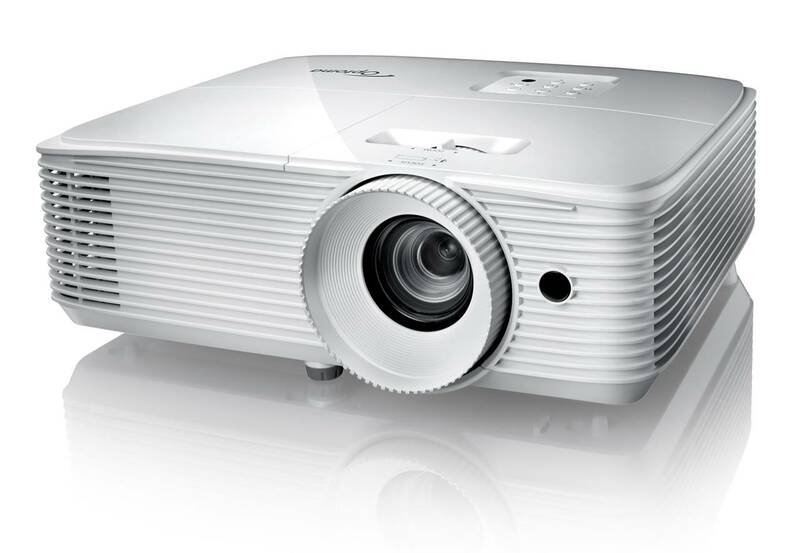 The Optoma projector also has a 50,00:1 contrast ratio, 1.1 zoom and vertical keystone correction feature. We also liked the fact it comes with a 10W speaker that provides decent sound quality for movies and cinematics. 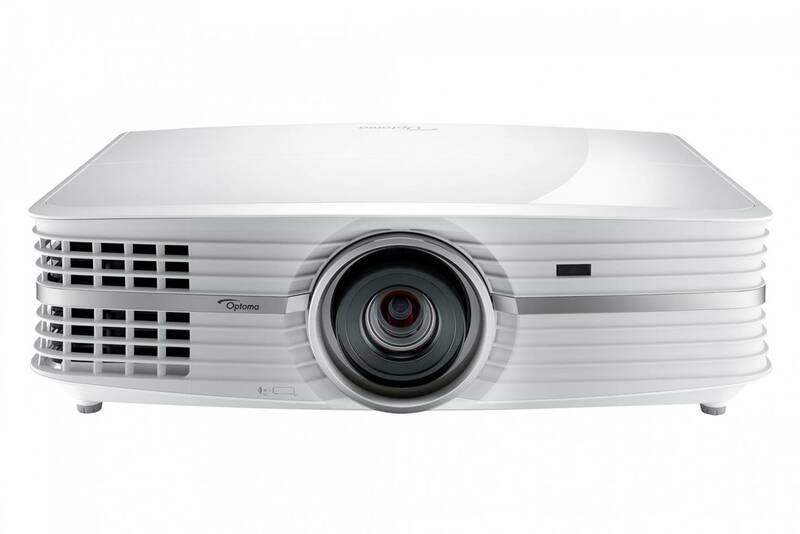 In terms of visual quality, we were highly impressed with the Optoma HD27HDR projector. It provides stunning picture and detail for home theater entertainment – movie scenes came to life with gorgeous details and vivid high contrast colors. This projector also combines a reference display mode with brilliant colors to deliver bright and accurate coloration. The projector also supports an enhanced gaming mode compatible with 1080p HDR sources. If you are looking for a portable setup with superb 4K ultra-high definition visuals, we highly recommend this home theater projector. The JMGO JS6 4K projector for home theater is one of the best projectors that delivers an incredible home theater experience with 1080p full HD with a brightness of 1100 ANSI lumens with DLP technology. This projector supports 4K ultimate HD video decoding with full support for HD 3D movies, Blu-ray, video games and HD broadcasting. We also liked the fact that the JS6 supports auto-focus and vertical keystone for convenient operation. It also allows you to adjust the brightness, fan noise, imaging and other settings based on your preferences. The projector supports Android operating systems so you can load your favorite content streaming apps for movies. The J6S comes with built-in Bluetooth stereo speakers and dual 5W hifi-speakers to provide a complete cinematic experience. The built-in speakers on the JMGO projector have wider frequency range for deeply resonant bass and soaring highs to produce pure vocals, delicate details and crystal clear sound without any distortion at high volumes. 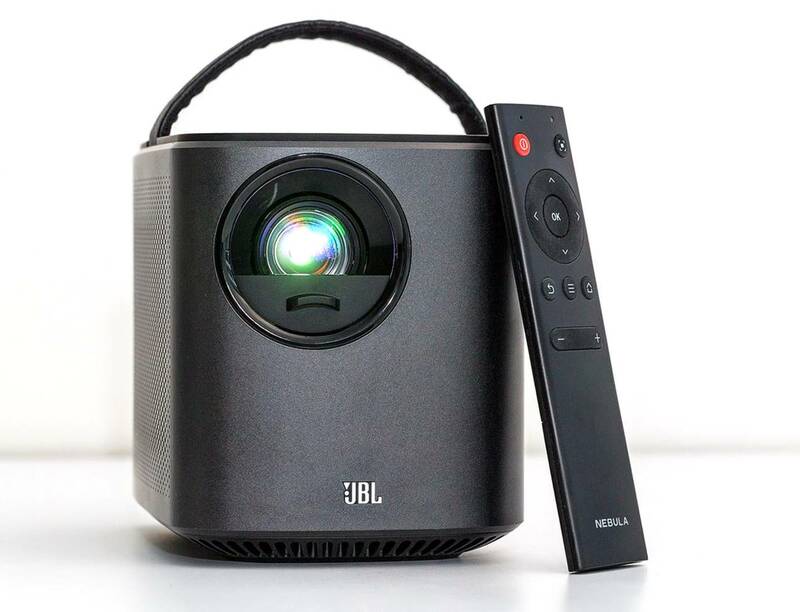 The JMGO J6S projector is designed to be portable and easily connects with your smartphone, PS4, Xbox One with wifi connectivity. You can also enjoy full 3D true-to-life movie and supports screen mirroring through Happycast. 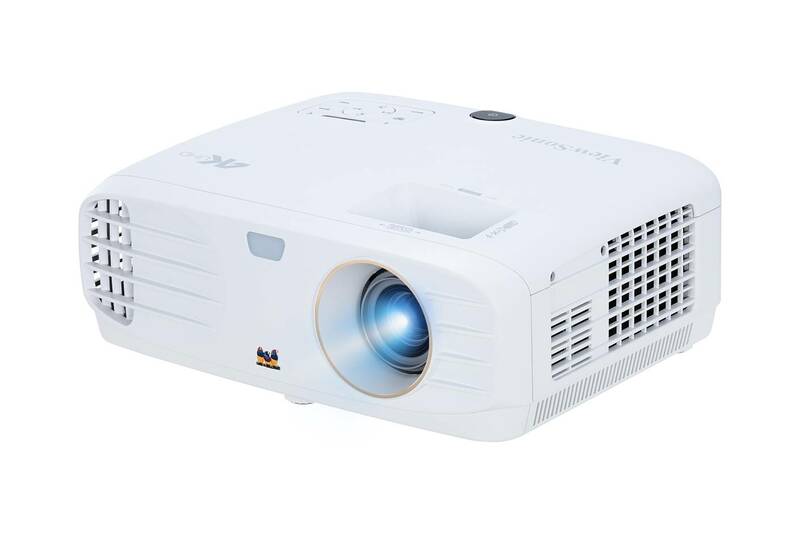 This projector has a compatible maximum resolution of 4K with 1100 ANSI lumens. The native resolution is 1920 x 1080p, with a contrast ratio of 3000:1 and lamp life of 30,000hr. 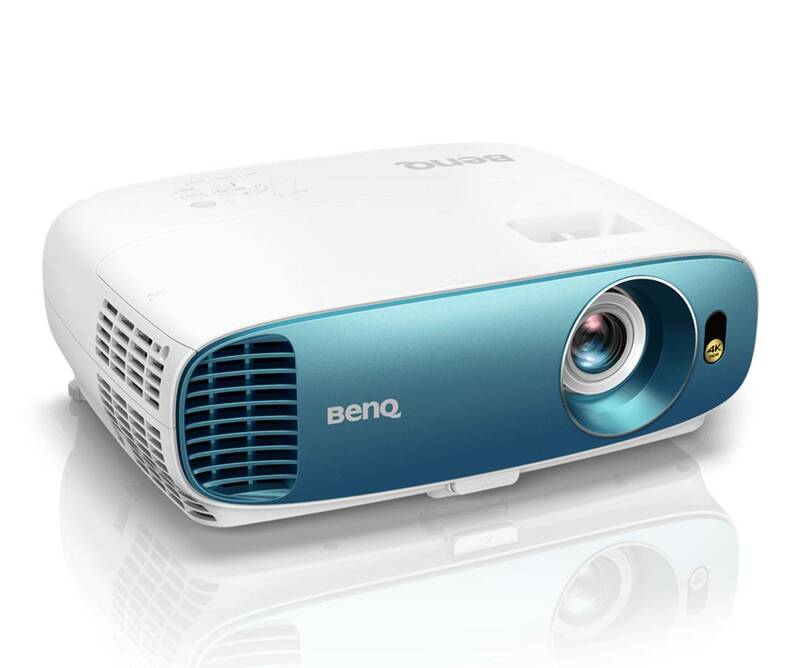 The BenQ TK800 is one of the best 4K projectors for home theater that delivers crystal clear video resolution with 8.3 million pixels. It supports 4K ultra-HD resolution with true 8.3 million pixels that provides 4K UHD image quality with incredible clarity and crisp visual details – the images are so sharp that it feels lifelike and on par with digital cinema screens. The projector delivers vivid colors in any ambient lighting with perfectly balanced high visual brightness (>3000 lumens) and vivid colors (>92% Rec. 709) for well-lit environments. We liked the fact that this projector supports hyper-realistic HDR10 quality – it optimizes the HDR features and natural color, tone and contrast. The entire projector is designed to be compact and light which makes installation quick and easy; it also has vertical keystone with 1.2x zoom for home theater. The projector has dual HDMI ports for easy connectivity. We thoroughly enjoyed watching movies and video performances on the BenQ TK800 – the images are sharp and crystal clear, which makes it feel as though you are immersed in the real life movie scene. The TK800 has 8.3 million pixels with projector-optimized HDR, so you can pick out details in the movie that you might not have noticed before. It also has enhanced brightness and contrast with one-step image optimization and automatic HDR natural color rendition. We also liked the fact that it uses 0.47” single-DMD chip DLP technology with four times the resolution of full HD 1080p. Overall, the BenQ TK800 is one of the best 4K projectors for home theater and we highly recommend them. The XGMI H2 is a well-designed 4K projector for home theater that projects a full HD image with physical resolution for up to 1920 x 1080 pixels. The projector has a completely re-designed cooling system and 4-channeled beam which enables 1350 ANSI lumens brightness, providing great contrast for movies and home theater. 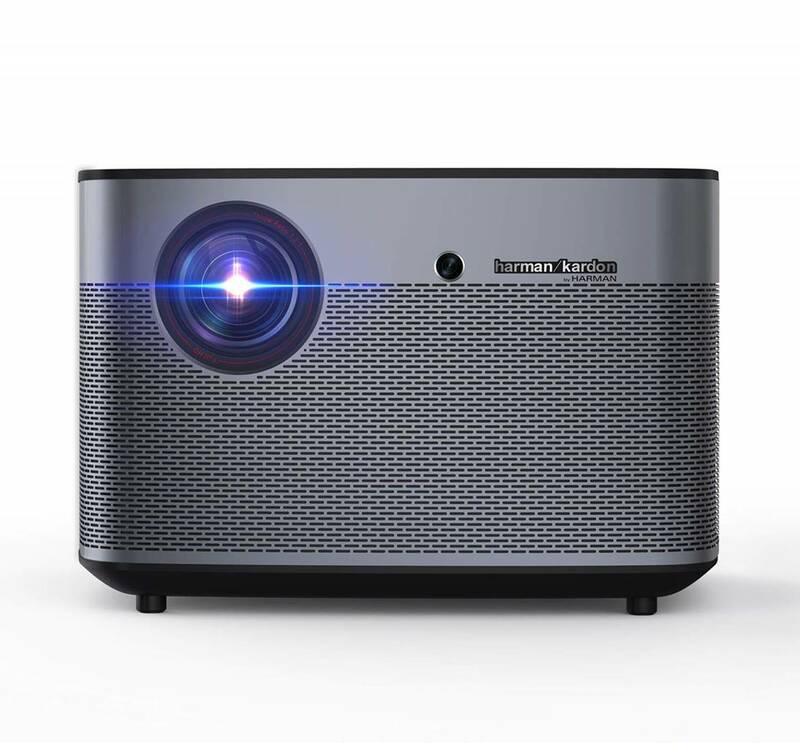 We also liked the fact that the H2 projector comes equipped with Harman Kardon stereo speakers which produces crystal clear and vibrant sound performance – the speaker can also be used as a standalone set of Bluetooth speakers. The XGMI H2 is equipped with auto-focus functionality with high resolution cameras – it is able to automatically adjust the focus and provide a clear image with no further manual adjustment. We liked the fact that this system supports Bluetooth 4.0 and dual-band 2.4/5GHz wifi which ensures more stable transmissions and smooth watching experience. The projector is designed for long service life with practically zero maintenance required on an energy efficient LED light source – it can be used for 8 hours per day for up to 10 years. We would also mention that the H2 features a cutting-edge Mstar 838 CPU with powerful cortex-A53 structure, high performance GPU and 2G RAM with 16G internal storage. It comes with high quality video hardware that is suitable for high-end movies and games. If you are looking for a 4K projector for home theater with a great design and long usage capacity, we recommend the XGIMI H2. The BenQ TH2550 is one of the best 4K projectors for home theater, delivering true 4K ultra-high definition resolution with 8.3 million distinct pixels. Movie scenes and cinematics have stunning clarity and crisply defined details which makes it feel lifelike and very realistic. The TH2550 is a projector-optimized HDR supercharged by HDR10 support with auto HDR color rendition and cinema-optimized technology. We liked the fact that the TH2550 projector has cinematic color technology which accurately reproduces >96% of rec 709 color gamut for an authentic cinematic experience. The entire project is designed to be light, sleek and compact with auto vertical keystone and 1.2x zoom which makes installation quick and easy. Cinematic performances on the BenQ TH2550 are crystal clear – you can see details in movies that you might not have noticed before. The contrast on the movie projector is excellent with vibrant and vivid colors – this projector has four times the resolution of full HD 1080p with 4K optimized optical systems for precise imaging. 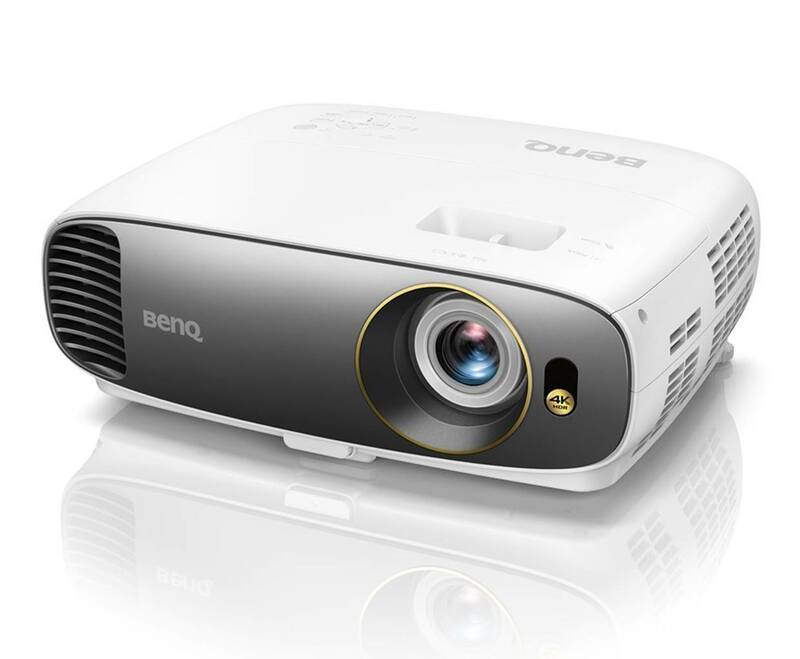 Overall, the BenQ TH2550 is a compact and portable projector that delivers cinema-like movie with high-definition quality, and comes highly recommended. The Nebula Mars is one of the best 4K projector for home theater you can find on a budget. It delivers a brilliantly defined picture with a dazzling 3000lm LED lamp which projects 500ANSI lumens for a crisp 800p picture with enhanced contrast for sharp and clear daytime viewing. We also liked the fact that this projector comes with built-in JBL 10W speakers for high-fidelity sound performance. The projector is also designed for extended viewing time with a 19500 mAh battery which delivers up to 3 hours of non-stop cinema. 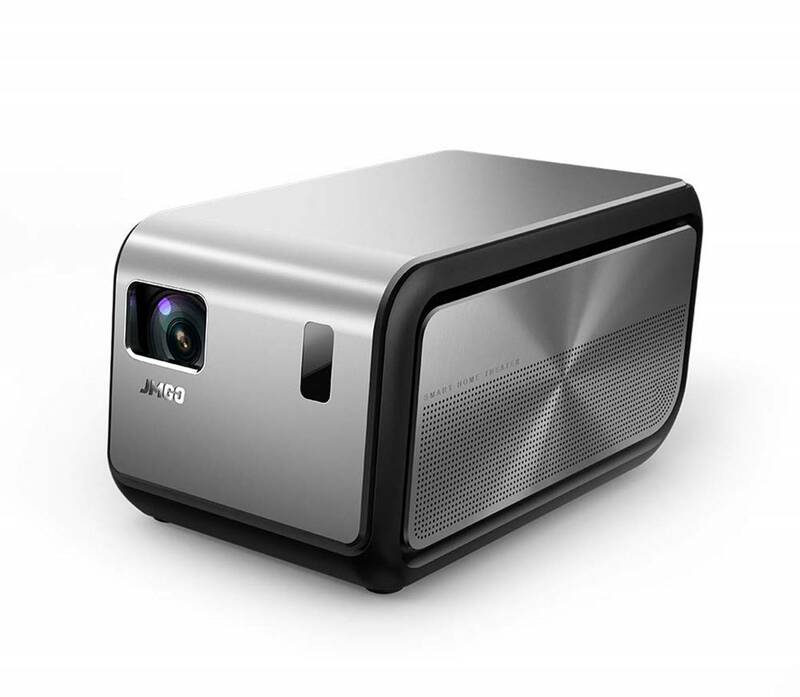 The Nebula Mars projector is capable of wirelessly streaming content from iOS and Android devices. It also supports 3D display with cutting0-edge DLP image-forming technology which brings 3D effects to life. This projector supports HDMI input and USB 3.0 for easy connectivity. The projection resolution of the Nebula Mars is 1280 x 800 pixels.